Level-3 Retention Holster for Sig Sauer Black SP2022/SP2009/220/226/P227/228/MK 25. Designed for the additional security needs of law enforcement, the military and other armed forces, the IMI DEFENSE Level 3 holster offers a secure dual safety retention mechanism with an easy combination of thumb and finger press to draw the firearm within minimal time. We achieved Level 3 protection by adding a contoured cap above the pistol to complement the highly successful IMI Defense trigger guard retention system. The IMI Defense Level 3 Holster offers the same versatility and user modularity as our standard Roto/Retention holsters because of our unique mounting system that allows connection with any of our platforms and the ability for the user to determine rotation angle btw. 0-360° Level 3 Retention Roto Holster for Sig Sauer - SIG PRO SP2022/SP2009/220/226/P227/228/MK 25. Dual-Safety Retention system with zero time to disengage. Rotates 360 degrees for every application. Connects to all IMI DEFENSE Platforms. Made of highly durable polymer. Adjusts with simple Allen key. Available in Black, Desert-Tan & OD-Green. IMI Defense was established with one mission: design, manufacture, and supply the highest-quality and most innovative firearm products and accessories to the military, law enforcement, and civilian communities. Ground-breaking polymer holsters and polymer magazine pouches are hallmarks of the IMI Defense line of products. With the expertise of a team of the worlds foremost engineers, military/law enforcement experts, and firearms production specialists, IMI Defense products integrate years of military know-how with battle-proven, durable and ergonomic materials. Developed in Israel, each IMI Defense product has met the most demanding needs of the military and defense community, and has won acclaim among the elite units of both the Israel Defense Force and Israel Police Force. We are proud that today IMI Defense products are used all over the world by the military, law enforcement, and civilians. All items are made and packed in a non smoking environment! 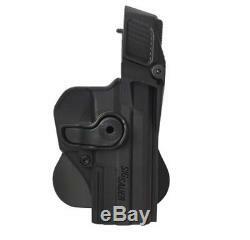 The item "Sig Sauer mk 25 Level-3 Retention Gun Holster Black used by the IDF" is in sale since Friday, March 15, 2013. This item is in the category "Sporting Goods\Hunting\Holsters, Belts & Pouches\Holsters". The seller is "yaron_il" and is located in petach-tikva. This item can be shipped worldwide.